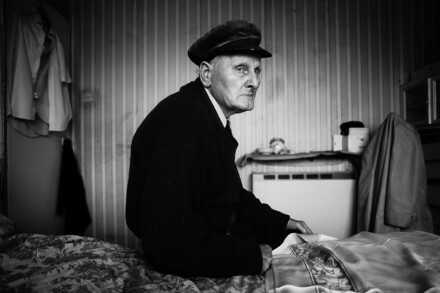 Gonzalo Bénard: Small Town Inertia: do you want to explain the title or the story behind it? Jim A Mortram: Small Town Inertia is a long form documentary and environmental portraiture series that I have been working upon for the last 3 years. It concerns itself with the real life stories of several people within a 3 miles radius within my local community in Dereham, East Anglia in the UK. The title stems from the notion that many people end up and stay here even though they desire to leave. I entered into the series with the notion that everyone has a story and with a desire to afford a voice to those that often have no platform to communicate their story. Themes have varied from person and situation. I’ve reported about isolation, poverty, drug abuse, homelessness, self harm, mental illness, juvenile crime, epilepsy though for myself the over riding experience has been one of endurance in spite of the impossible walls life often presents to us. Wall’s that box us in, wall’s that separate us, wall’s to climb to be set free. 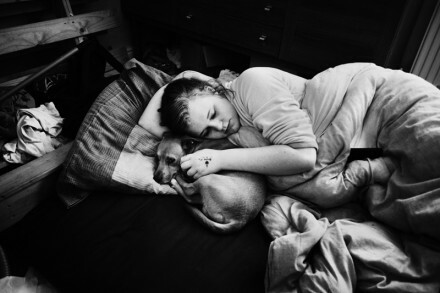 Small Town Inertia reports from within these documented lives. Lives lived in the now. Lives lived within times of much change. As the cultural, political and economic landscape changes these stories depict the final destination for the results of many of those high up and far away decisions and influences. 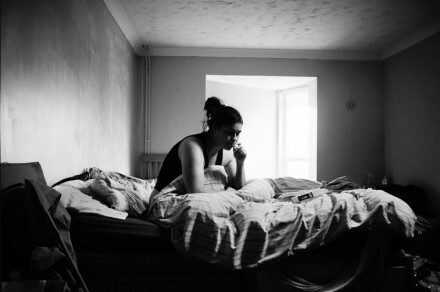 These photographs and supporting stories depict the full stop of the Welfare State cuts, Housing Benefit cuts, Health cuts, loopholes and failures of systems and what happens when the heart of a community is slowly eroded. They also depict the lives of those hanging on, bowed yet not broken, of lives where a fight to survive is very real. Fighting apathy, addiction, fighting loneliness, illness all the while clinging to self-respect, adrift in the community, in life, but not yet lost. Gonzalo Bénard: Everybody can see the tremendous quality of your photography, even on internet where sometimes we can’t see it properly, so let’s not talk about it and let’s go beyond the technical stuff. Since I know your work you’ve been always focused on what it is to be human, bringing naked-fragile minds through your portraits. What’s the relation that you have with them all to achieve such deepness and honesty when doing a portrait? Jim A Mortram: I always treat people, as I myself like to be treated. You can never feign nor fake interest in a person. I’ve never singled out people with an eye that they might make a good story for example; it’s a very organic evolvement. Though every person I’ve photographed I’ve met as a stranger over time bonds form, trust very much has to be earned. People are very giving and that humbles me greatly, my greatest debt is always to the person the other side of the lens. It’s such a great honor to be accepted and brought into another person’s life and given the access to document it. I’m sure I could work in a faster fashion but for me long form documentary is where my heart is. Often I’ll visit people and not even take an image, just talk and more importantly listen, and I listen more than I shoot. I have an equation that I always bear in mind Talk more than you shoot and listen more than you talk and it serves me well. 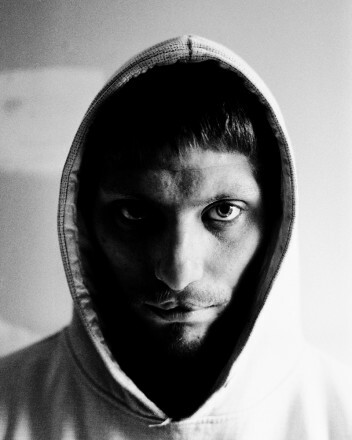 I break shoots up into periods of straight documentary and periods so shoot portraits, make interviews and shoot video. 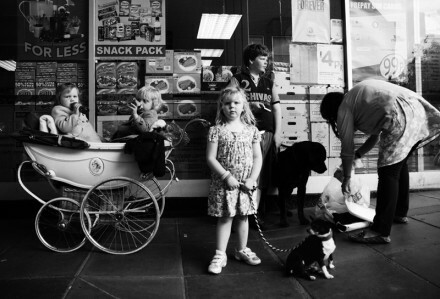 The most wonderful outcome of the series is seeing the positive effects that it has upon the people featured within the series, our very real bonds and the sense of community, both with the people I photograph and from the wider photographic community itself whom have been of outstanding support. Gonzalo Bénard: I know that your main job is to be a carer, but your hobby became a continuity of that. 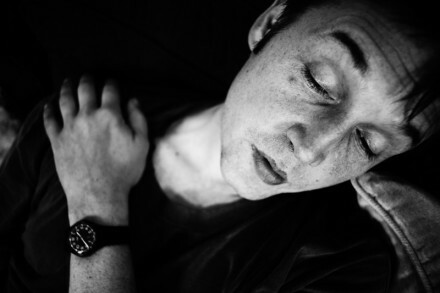 Do you feel a carer when you’re photographing them? Jim A Mortram: That’s a really interesting question and something I’ve often mused on. My conclusion is that being a Carer, especially for a loved one, a member of the family has influenced me as a person and those experiences evidently trickle down and appear in my personality now so are present when I shoot. It’s a high stress situation working as a Carer and you need to develop many skills you’d never use in everyday life, elements such as thinking really fast in serious situation, life threatening ones from time to time, acute patience and knowing when to shut up and listen, to understand what a person needs when they can’t always communicate. All these have had a real impact on the way I communicate and especially listen during shoots but I have never felt like a Carer, everyone I shoot is just like me, were all human being regardless of what we might be experiencing, I always take that into every situation I go to document. Gonzalo Bénard: Do you feel that for them is important you to be there and in some way leaving a register in your photographs? Do you feel this ex-change when you’re with them, being important for you to photograph and for them for being photographed? Jim A Mortram: Yes. Very much show and for many reasons. Initially it’s to have an opportunity, ANY opportunity to share their experiences and to be heard. It’s, I feel a really empowering step for the people I work with on these long form series to make the decision to get involved, stay involved. It’s a way for many people to take a positive step, to maybe take some control where there might be a huge absence of any control in their lives. It’s also a mirror for many people, it might be the first time that they have paused for thought as every day is just surviving, enduring and when you live just to make it through one day to the next it’s often hard to distance yourself from that experience and take a moment for reflection. Gonzalo Bénard: Do you want to share a special moment with any of the people you shoot towards your photography or you being photographer? Jim A Mortram: I’d first encountered Shaunny totally by chance as I’d taken a street shot of him taking his shirt off outside a pub in Market Town. Subsequently that shot went on to place 3rd in the Photo Radar POTY (Documentary) and I wanted to find out who it was I’d made this random street image of. Market town is a small place and it did not take too long to find someone that knew someone that could put me in touch with Shaunny. I got an email and arranged a meeting at his home. At this time I was still borrowing a camera and lenses so I’d picked them up the morning of the shoot along with for the first time a 50mm. My sessions always work the same. There is a lot of talking. I’ll always set out what the project is about, where images will be shown etc and then we really get into exploring life. Many times the people I shoot have no significant opportunity to talk, open up or be listened to. I like to ask a question then let things roll, to let the person reveal as much as they are want to share and interject with further questions throughout the conversation making fresh junctions together, seeing where it takes us. I’d started with a 28mm, a f2.8 and the light was very dark that day and the D200 I was using was not the best camera for an interior, little light and so I was pretty much forced into putting the 50mm f1.8 to the body to give myself a little more room to play with. This first shoot with Shaunny was one of the first that I’d really explored intense 1 on 1’s. Walking into a total strangers house was quite something but my own fears were suppressed by the desire to do justice to what was happening within the room. Shaunny was opening up more than I had expected. Within 15 minutes of arriving he was opening his soul to me, every pain, loss, regret began to flow forth, at first just a trickle but soon becoming a river that was to burst it’s banks. “I never talk to anyone about this stuff” Shaunny said as we talked through the loss of failed relationships, finding his Mother passed away at 15, the death of his young children, his battle with chronic back pain due to an accident, his self medication with alcohol. “Do you want to stop? I can put the camera down at any time” I told him, we were very close, the 50mm forces you to use your legs as a zoom so I was maybe 1 foot away from Shaunny, both of us standing parallel to the single window in his flat. Winter skies outside, I remember someone revving their car, redlining it, testing the engine outside a monotone drone that seemed to amplify the words, the stories Shaunny was sharing. There was no longer a camera between us. I often look over the viewfinder so actual eyes can lock, I shoot manual so that was spot metered and taken care of, shooting wide open at f1.8 hand held is tricky at the best of time and as Shaunny’s first tears started to come I fought to keep my own hands from shaking. “Do you want to stop mate, I don’t have to photograph this” I asked again “No, I want you to, this is the first time I think I’ve ever opened up about these things, I want people to know I have regrets, that I am sorry, that I’m not who they think I am, I want people to see that I hurt too”. Shaunny saying that was a revelation for me. I could easily have put the camera down had he not said that. In that moment I knew that to not do my best in this situation would be a dereliction of duty. Here I was, in another mans home, toe to toe with him baring his soul and tears, very old, bitter, painful and real tears spilling from his eyes and I felt for the first time the burden of a very wanted responsibility. I could feel myself totally engaged in this moment, this shared moment and also aware of controlling the camera, probably nervously as I’d never used a f1.8 50mm before so I was as nervous as all hell of getting it wrong but everything was happening so fast I just had to let the fear go, rely on instinct and carry on. This really choked me. Thank me? I’d done nothing. Pressing a shutter is no big mystery to me. I’d not expected this day to unfold anywhere close to where its destination eventually was. It was becoming a moment of very real clarity for me too. These moments were teaching me why I had to pursue the Small Town Inertia series, that every person has their story, tales of loss, tales of joy, endurance regrets and hopes of redemption. Instead of 15 minutes of banal transient fame they deserve, instead of being the focus of an imposed ego destined to be art on a wall we all deserve to be listened to at the very least within our lives. I packed my gear away and as I left I told Shaunny that I’d sit on the images for a while and visit again with a print, if he wanted them public we’d go from there. When I got home I was relieved the shots had come out at all. Whilst editing them I found the shots with open eyes a little too obvious and they somehow through all their evident pain lost some intensity and they did not really reflect the most poignant moment of that morning. The very last shot however did. 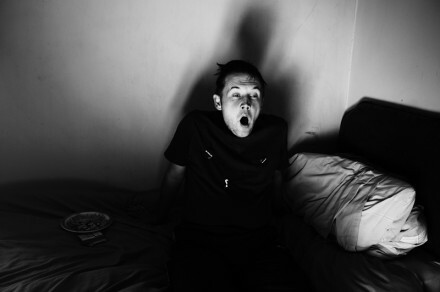 When Shaunny paused for that final moment, tears upon his face with eyes closed finally reflecting upon the life, his life and all it’s pain and all his regrets that he had just fought into and excised and shared for me epitomized the pain, struggle, endurance, reflection and acceptance of that cold morning shared in a flat with a stranger. A few weeks later I returned with a print. I was weary, would Shaunny be pleased, would he not want to share the image at all. My fears were allayed instantly. Shaunny loved the image, was proud of the day. We’ve gone on to share many other moments together as I’ve documented his life and the portrait we made together hangs on his wall still. Gonzalo Bénard: You’re creating a relation with them, only that way you can also have the honesty in your work that is so important, and I guess that this is not a short time project but a longer one. Do you want to show the evolution of being alive in such register? Jim A Mortram: Absolutely. I could not see myself working in any other way than long form. Without the time invested I think I would document in a much shallower, ephemeral way so taking months, years to constantly document and share it gives the series context, there is a evolution within the lives, to tell any story you have to do more than read chapter one you have to read from the front to the back cover. Gonzalo Bénard: Which is the evolution you noticed more since you started this social photographic work till this latest one you’re still developing? Jim A Mortram: I firmly believe that you never reach a destination; I’m constantly moving forwards in terms of the way I do things mostly as I believe we never stop learning. The largest constraints to the work are financial; it’s hard to self-finance travel, film, equipment, bills etc when you pay for everything from Carers Allownce Benefits and that’s frustrating but not enough of an obstacle to stop my work on these series. 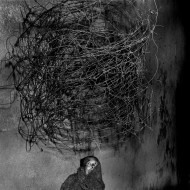 Gonzalo Bénard: Apart from the exposure you’re getting with your photography that can and should bring more awareness to our society, is there a immediate and practical help you’re getting or can get doing this work with/for them? Jim A Mortram: I’ve had a wonderful reaction from so many photographic peers, curators and editors, something that began slowly and led to a point where I have a wonderful network of friends that help out in many ways which is something I value so dearly. RE the project I get no financial help outside the occasional donation, no Arts grants etc. One company that has helped me has been the UK Office of Hahnemuehle papers that were just fantastic in supporting my last exhibition, without their help the show could never have taken place at all. Gonzalo Bénard: Of course that there’s always people who think that you’re taking advantage of them, and I’m saying this by some comments I read on an article about your project on BBC news, maybe from people who never did anything useful nor are aware of your real work. Is there anything you want to share to our readers who don’t know you? 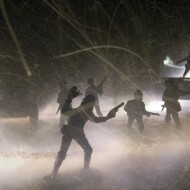 Jim A Mortram: It’s easy for people to make a snap decision when looking at a series or a single image, I can understand that and honestly many of the situations people I work on stories are in, I’ve experienced myself so I have a real and true empathy, a connection with them and that’s mutual. I’ve always made sure everyone I’ve ever worked with fully understands the project, consent is always the first element discussed and I’ve never had a complaint from anyone that’s been a part of a series in fact it’s just the contrary as my phone often rings with people wanting to do it, to be involved. What people maybe don’t understand is the depth of commitment between all the people in the series and myself, it’s long term and very real. 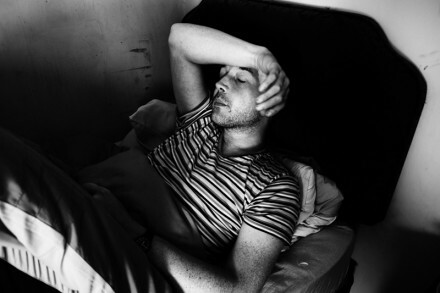 Gonzalo Bénard: How can someone take part on this project or how can someone help you/them on this Small Town Inertia? 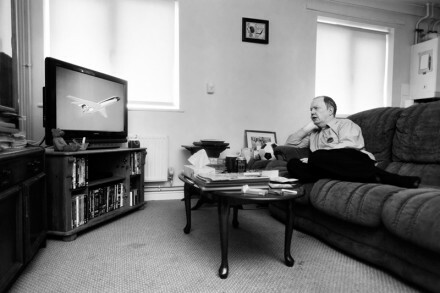 Jim A Mortram: The most important thing I would always say is to view the images in context with the interviews and testimony upon the Small Town Inertia site or the Aletheia Photos site of which I’m a member. 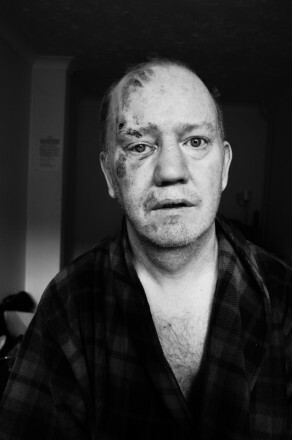 If anyone would like to help the project there is a donate link upon the Small Town Inertia site.